For those of you who haven’t read Stephen Elliott (http://stephenelliott.com/), he’s a hell of a writer. His last book, THE ADDERALL DIARIES was/is one of the best I’ve read in the last few years. He takes what’s becoming an increasingly formulaic genre (the memoir) and makes it new. Truly, a great book. Several of his other books are very strong, as well–my favorites are HAPPY BABY and MY GIRLFRIEND COMES TO THE CITY AND BEATS ME UP. Also, WORKING BACKWARDS was named one of the notable books of 2010 over at The Nervous Breakdown. It’s a real honor to be on this list, especially with the quality of the other books. And, not only that, I’ve now reached a career goal of being mentioned in an article with Keith Richards. So I can retire happy now. I had a really fun interview with the great Gina Frangello (http://www.ginafrangello.com) that’s up at the Rumpus. There is nothing quite a great two-guitar rock and roll band. By this, I don’t mean just any band where one guitar strums rhythm, while another player does the lead, but a band where the two guitars work together so symbiotically, they become almost a single great instrument in the band. When two guitar players are truly locked in, the give and take creates a tension that just doesn’t, can’t, happen when there’s only one guitar player. This doesn’t mean you NEED two guitars to make a great band—I’d be leaving off a lot of great guitar music if I scratched Hendrix, Cream-era Clapton, The Who, early Uncle Tupelo and a ton of other great bands. Nor do you need to have the kind of two-guitar interplay I’m talking about to have a great band—there are fabulous bands with two guitars playing standard rhythm-lead arrangements that don’t fall into the category I’m talking about here. Bands like CCR, the Beatles, the Byrds, Big Star, the Replacements and the Kinks are filled with great guitar work. But great guitar work done (usually) in the traditional rhythm/lead style. No, I’m talking here about bands where the two guitars are so intertwined, so filled with communication that the players seem to be operating on a telepathic level when playing. There’s nothing quite like it (for the player or audience) when two guitars really have that going on. The Rolling Stones: While there may not be a “particular order” you kind of have to put them first because, well, they’re the Stones…not named “The World’s Greatest Rock & Roll Band” for nothing. While early Stones is incredible, and Brian Jones had a wonderful genius for playing, well, for playing things that weren’t guitars (sitar, dulcimer, and so on), the band really starts becoming a major two-guitar band in the Mick Taylor years (1969-74). Listen to the interplay that drives through EXILE ON MAIN ST and you’ll hear Richards and Taylor at their best. Ron Wood, the “new guy” (all 34+ years of being the new guy) is no slouch, either. Richard Hell and the Voidoids (first album, especially): Ivan Julian and the late, great Robert Quine offer up a killer dose of dueling guitars on the first album. Great tones, great playing and great intertwining parts—while showing each player’s distinct style in their solos. Check out the traded leads on “The Kid with the Replaceable Head” and tell me you don’t love guitar. The Dream Syndicate: For their whole career, but especially on the still fresh and incredible sounding DAY OF WINE AND ROSES. The original lineup of the band (with Karl Precoda and Steve Wynn on guitars) brought back long guitar songs—reclaiming them from boring patchouli drenched jam bands and given them back to rock and roll. Examples? The title track, with Precoda torturing a Harmony-made Silvertone awash in feedback, or “Halloween” with Wynn showing us why those plinky Jazzmasters are such great guitars when used right. And they are used right here. Luna: Again, most of their recorded work. But the live version of “23 Minutes in Brussels” from the fine movie of their final tour TELL ME DO YOU MISS ME is a good place to start. They were always a great night out for lovers of guitar (or of great songs) and this has some great live footage of underrated guitarists Dean Wareham and Sean Eden (along with a fabulous rhythm section…actually every band on this list has a great rhythm section, which should tell you something about what guitar players need to soar) making some great guitar rock. Also, anyone who doesn’t own PENTHOUSE has missed out on some of the best music of the last 15 years. I wouldn’t stop there, but it’s not a bad start. Neil Young & Crazy Horse (especially in the Danny Whitten era): Later versions of the band have Young handling (quite capably, btw) all the lead guitar. But to listen to the interplay between Young and Whitten on EVERYBODY KNOWS THIS IS NOWHERE is a true joy. 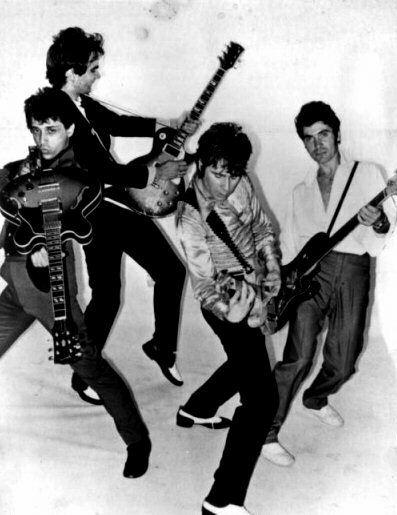 Johnny Thunders and the Heartbreakers: Maybe a surprise pick, but damn if LIVE AT THE SPEAKEASY doesn’t show the 2nd-Generation Heartbreakers (after Richard Hell left) as one of the great two-guitar bands of all time. Walter Lure and Johnny Thunders learned all (or at least most) of what was great about Chuck Berry, Keith Richards and R&B and tossed it into this great mix. If there had been less heroin and better lyrics in this band, they might have conquered the world. Television: Wow, three bands that Richard Hell was a part of at one point (though he isn’t on any of the classic Heartbreaks or Television material). But Tom Verlaine and Richard Lloyd set the bar for punk-era dual guitar bands. 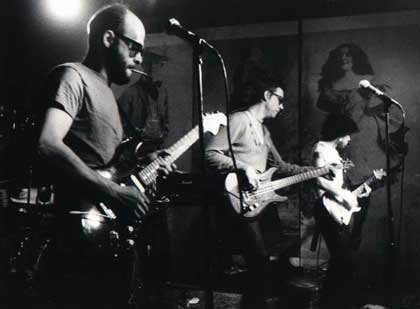 Listen to the majesty of the building guitars of the title track on MARQUEE MOON, or the incredible intertwining guitars on “See No Evil” or “Prove It.” One of the all-time great bands for guitar-heads. These two guys play together, as Richard Lloyd once said, “like the gears of a watch.” No doubt. Wilco: Another, perhaps, surprise pick. And while, if I had to choose (and I’m glad I don’t), I’d take the Jay Bennett era Wilco over any other lineup, the current lineup is a better live band and able to show off a range than would stun most rock bands. Nels Cline has been showing the world what had been one of LA’s biggest secrets prior to his joining Wilco—that he’s one of the best guitar players alive. A man able to play a three hour show and not play a cliché. Not easy. And for anyone who doubts Jeff Tweedy is a great guitar player, listen to “Kidsmoke” (off A GHOST IS BORN) and tell me differently. One of the great guitar songs of the last ten years. Also, check out any live footage of the current band doing “Impossible Germany” which blends not two, but three guitars (thanks to multi-instrumentalist Pat Sansone) in about a beautiful a fashion as possible. So, there you go. 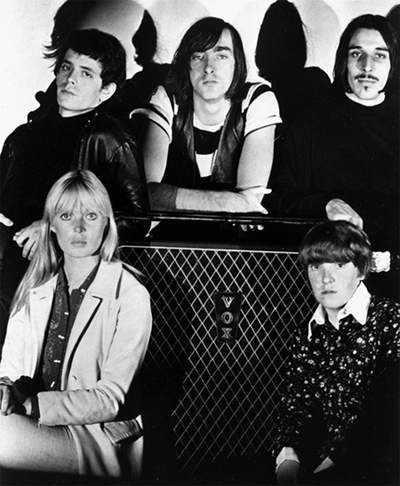 A short starter-list of great two-guitar bands. Buy some CDs, or download the MP3s or add it to your phone or the chip in your head or whatever it is you kids do to get music these days. But, remember, PAY the artist for it! New Mailer for the Book!